This article first appeared in Options, The Edge Malaysia Weekly, on June 19, 2017 - June 25, 2017. The 1951 Convention relating to the Status of Refugees (1951 Refugee Convention) has long been the key point of reference for refugee issues across the globe. It sets out the fundamental rights, freedoms and obligations of a refugee, defined as any person who owing to a well-founded fear of being persecuted for reasons of race, religion, nationality, membership of a particular social group or political opinion, is outside the country of his nationality and is unable or, owing to such fear, unwilling to avail himself of the protection of that country. To most of us, this may be nothing more than a wordy description. But to the millions of refugees worldwide, it succinctly illustrates what compels them to flee from their homes and the uncertainty that looms in the years that follow. Malaysia is not a signatory to the 1951 Refugee Convention; nor does it have any local framework to address the issue. The non-existence of a legislation is, however, not for a lack of need in that area. According to the UNHCR, there were 150,662 refugees and asylum seekers registered with the organisation as at end-April. The distinguishing factor separating them from the people in their host country is the circumstance and desperation that led to their fleeing their home country, often in fear of their lives. Choice is almost elusive in this scenario as they arrive on the shores of host countries and assume the label of refugee. The UNHCR began operations in Malaysia in 1975 when Vietnamese refugees began to arrive by boat. Over the next two decades, more than 240,000 were resettled in third countries while 9,000 others returned to Vietnam. 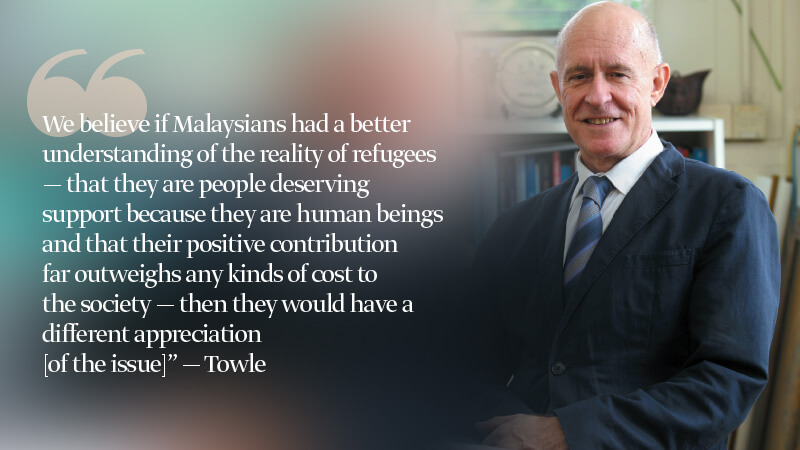 Towle has extensive experience in the sector since he first joined UNHCR in Hong Kong in the early 1990s. Prior to that, he practised as a lawyer in New Zealand, specialising in refugee and human rights issues and later became deputy chair of the Hong Kong Refugee Status Review Board. He describes his working with refugees as “both a spiritual and professional calling, as much as a conscious decision”. “I feel passionate about using my professional legal skills to make a difference to the ordinary people — particularly vulnerable people. It is humbling work. Refugees demonstrate some of the finest of human qualities, not some of the worst, and yet they are seen as aliens, foreigners and threats. At a personal level, once you meet a refugee and you see that they are just like everybody else — in fact, better than many of us because they are humble, resilient, grateful and generous people,” he says, appealing to the human factor that is sometimes forgotten when dealing with refugee-related issues. Towle also highlights how refugees in Malaysia are highly self-sufficient in many ways. He refers to schools — such as the Fugee School — that are run entirely on private funding with no cost incurred involuntarily by taxpayers. He says refugees are not a drain on public healthcare either — referencing private insurance schemes such as Refugee Medical Insurance Scheme (Remedi) offered by RHB Insurance in collaboration with UNHCR as well as cheaper but paying health clinic services. The absence of regulation governing the matter means that any assistance currently offered to refugees is rendered on humanitarian grounds. “Malaysia, like other countries in the region, has shown generosity to refugees for over 40 years, based on a rather informal humanitarian desire to help, but not on a structured basis. We think, with the complexities and challenges faced globally with regard to security, law and order, and crime, it is very important to have a more structured way of managing refugees in the 21st century than it was in the past. This does not mean that the state has to sign the refugee convention, but there is a need to have some sort of legal and policy framework,” Towle says. He recommends that a registration system for refugees be introduced to allow them to remain here legally. “Registration would mean they will not be arrested and allow refugees access to the workforce, for children to get appropriate schooling as well as access to basic services. These are very achievable small steps that any state could do and the benefits of doing so are very obvious to us. We think that a better regulated system would result in less crime, insecurity and threats to national security, which is good for the state and for relationships between states,” Towle says, driving home the point that the existence of a regulatory framework does not necessarily require any major change to the legal structure. When talking about refugees, a key issue that comes to mind is the restriction on employment, which is commonly cited as one of the biggest challenges they face. That said, it is not uncommon for refugees to find work in order to support themselves and their families, but doing so without proper guidelines leaves them vulnerable to mistreatment and discrimination with little or no legal redress. Chairman of the Malaysian Social Research Institute (MSRI), Datuk Mohammed Ab. Halim Ab. Rahman, finds that “most hardship for refugees in Malaysia stems from the fact that they are not allowed to work. Thus they are condemned to work illegally in dirty, low-paying jobs, disregarding their educational background, as many refugees from the Middle East are professionals”. Allowing refugees to work is high on the list of changes and Towle believes the benefits of doing so will far outweigh any disadvantages. “Refugees are here and they want to work — many are actually working so this could transform their work experience into a legal one rather than an illegal one and this would be a benefit to the economy. Allowing refugees to work would mean more stability and security to them as the money they earn goes into caring for their families, which would mean better healthcare and education as well as less dependency on the state,” he says, adding that given the chance, well-managed refugee populations can actually contribute positively to the economy and even pay taxes. The restriction on employment will also have a detrimental impact on the children. Co-founder of the Fugee School, Deborah Priya Henry, is concerned about the example that is being set for them. “The children see their parents or guardian home all day, not working, and the children will think: ‘They don’t work; why should I?’ They won’t understand the need to wake up in the morning, go out, be productive, earn an income and achieve things,” she says, adding that these are values that her school hopes to impart to their charges. As at February this year, UNHCR found that only 29% of refugee children (aged between 3 and 17) are enrolled in community learning centres. Refugee schools such as the Fugee School are implementation partners, working with the UN refugee agency to improve enrolment. Having always deeply understood the value of an education, Henry fears that without an education, refugee children are being set up for failure. Her strong desire to change this drove her and co-founder Shikeen Halibullah to offer English and maths tuition for a group of refugee children. That led to the birth of the full-fledged effort that is Fugee School. From an initial 60 students when it was set up in 2009, the school has 160 today, reaching more than 300 students over the years. Henry says the school has strategic partnerships with corporations and individuals to thank for its continued efforts and commitment to the cause. Naturally, the problems faced by refugee children vary from those of adults and Towle states “day-to-day insecurity and lack of a future” as the challenges that apply across the board. “Any human being who is uncertain of his or her future, and exposed to daily threats of exploitation, arrest or abuse in some way, will feel highly distressed,” he says. To him, the solution to these problems is clear. “A regulatory framework will go a long way to reducing insecurity because such insecurity can play out very negatively. It creates behavioural problems, intergenerational difficulties, violence, alcohol and drug addictions… it degrades and erodes the human spirit,” he says. The children also face adjustment issues, perhaps more than adults because of their tender age. “For the children, it is sometimes also difficult to go back to school after many months and sometimes years of fleeing from their place of origin, and dealing with loss and devastation,” says Halim. For his organisation MSRI, its efforts boil down to its three core programmes — an education programme for children and adults, a family health programme and a community service programme management. “The ultimate goal for our programmes is to help families who are asylum seekers and refugees get back on their feet, support them in emergency situations, and help them develop resilience in such a way that they are prepared and have the necessary skills to make a living here and are able to continue with their lives upon resettlement in their permanent country without much interruption,” the chairman says. Formerly known as Malaysian Sociological Research Institute, MSRI was set up in 1959 to produce and publish world-class academic scholarships. Founder and then chairman, the late Datuk Dr Alijah Gordon, changed the direction of the organisation when she started the MSRI/Sponsorship Programme of Palestinian Children upon hearing the horrific news that Palestinian refugees were asking for a fatwa to allow them to eat the flesh of their dead during the war in Lebanon sometime in 1988. The programme continues till this day through the organisation’s continued efforts in providing humanitarian support for the downtrodden, especially for Palestinian refugees in Lebanon. The options for refugees who are unable to return to their home country, usually due to security reasons, are between resettlement and local integration. Henry, who is both pragmatic and passionate in her approach, strongly disagrees with refugees putting their lives on pause while awaiting resettlement, which can take an indefinite period of time. “This (Malaysia) is transit for many people. It is my hope that their time here is not wasted. We need to prepare the kids to be global citizens. Unfortunately, they have had to run away from their home country to be here so we need to equip them with all the tools that they are going to need when they go to another country,” she says, explaining cultural assimilation, understanding and adaptation as some of the key areas. The ultimate aim is for the children to be confident and able to take advantage of any opportunity that may come their way. Having visited Lebanon and seen Syrian refugee camps, Henry feels strongly about the devastation and hopelessness that refugees go through. “People are so judgemental and opinionated about the refugee crisis, and what is happening in Europe has resulted in people having stronger negative opinions on the issue now. Walk in their shoes and think about what you would do if something like that were to happen in Malaysia. Where would you go? Anyone can be a refugee — not only the poor and uneducated from a Third World country. It does not discriminate,” she says. The school also places importance on empowerment besides being merit-based and gender equal as much as possible. This is ensured through programmes such as the Certe Bridge — which prepares students for tertiary education — and the Student Activities Programme (SAP) — a two-pronged approach through which students learn outside the classroom while the volunteers learn from them too. The school is also proud of its first football team for girls in the Somali community and its service learning module which teaches students to give back or pay forward a good deed. “You can’t take all the time. Even at your worst moment, you can still give,” Henry says. People often fear what they do not understand, and this is true when it comes to refugees as well. Towle believes that awareness should be cultivated at the family level and continue in schools and faith-based institutions, followed by the media and the political narrative of the state. “The situation of refugees around the world gets bad press, by large. Particularly in this day of militancy and terrorism, refugees have been unfairly tarnished with that reputation. What people don’t seem to appreciate is that refugees are escaping exactly those things! They are fleeing from intolerance, insecurity and persecution,” he explains. Amid the turmoil in home countries and lack of policies of host communities to receive refugees, the call for a legal framework rings loud. Clear regulations and guidelines could be the best way forward to monitor refugee-related issues. Towle says there have been constructive discussions with the Malaysian government on this and there are positive indications of change. 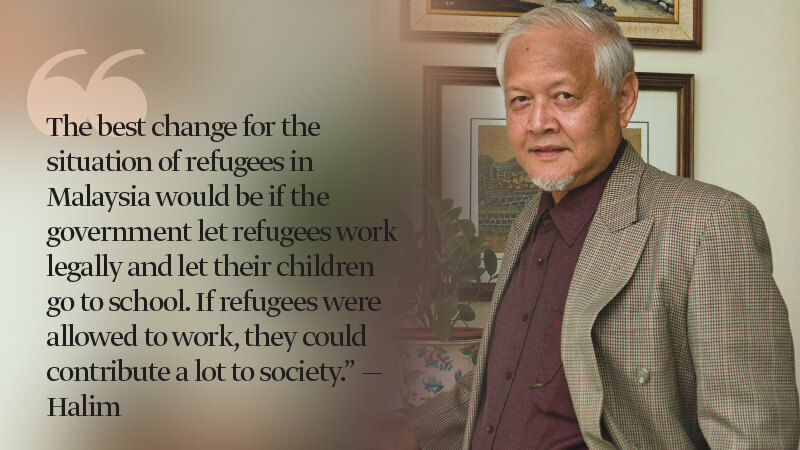 “We believe if Malaysians had a better understanding of the reality of refugees — that they are people deserving support because they are human beings and that their positive contribution far outweighs any kinds of cost to the society — then they would have a different appreciation [of the issue],” he says. On this, Towle is broadly optimistic about being able to find solutions in the long term with cooperation between UNHCR, the government, NGOs or non-profits and civil society.